Official Google India Blog: It’s YouTube Kids’ first birthday in India, and celebrations are in order! It’s YouTube Kids’ first birthday in India, and celebrations are in order! Time sure flies, it’s been a year already of our launch in India and we’re delighted to add to the celebrations with the roll out of a brand new experience on the YouTube kids app. After talking to parents all over, we know that kids who love the YouTube Kids app are getting older and want a platform that’ll grow with them. We also realize that every family is different, so we’ve built features into the app that help you control the experience for your kids whilst also ensuring we pack it with rich content that your kids will love. With the updated version of the app, we are giving parents full control of their kids screen time and the content they consume. The updated app also provides kids a more personalised experience with ability to create their own identity and enjoy content which is linked to their profile in case of shared devices. YouTube Kids is the go to app for kids to learn, discover, create and explore their curiosity. And we are seeing incredible diversity in the kids content coming out of India. While Hooplakidz and Chu Chu TV are right up there with some of our top global creators, Do It Yourself Content, Art & Crafts, animated educational content and a lot of fun science content in local Indian languages is now seeing major traction in India. 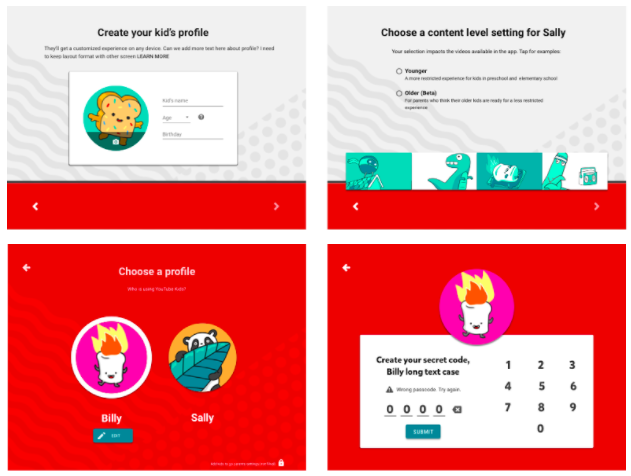 Create Kid profiles to customize your kids’ experience: Now you can create a profile for each of your kids and choose between younger or older content levels to manage the types of videos they can watch. Kid profiles work across all different devices! More parental control: When parents open YouTube Kids, it explains upfront how our systems choose and recommend content and how to flag videos. We also prompt you to make a choice about the type of content, parents want their children to have access to. Parents can decide the right experience for their family from the get-go. Remember, our systems work hard to filter out more mature content from the app. But no system is perfect. As our video inventory grows, we will continue to rely on you and our parent community to provide feedback, since there’s always a chance a child might find an inappropriate video in the app. If you find a video that you think should not be in the app, you can block it and flag it for review. This helps make YouTube Kids better for everyone. We're looking at ways to build an even better experience for families. Coming soon, we'll give parents the option to bring more content to the app experience. Our team is working to identify the most relevant content categories for tweens to make the app even more awesome!